Buying a home is one of the biggest traditional mile markers in American life. Although many millennials are happy to rent, more and more members of Gen Y are finally starting to dip their toes into the waters of home ownership. If you're thinking about buying a place of your own, it's important that you know your finances are in order before you start browsing listings and hitting up open houses in your town. It's tough enough to manage student loan debt, build emergency savingsand invest for your future without the added responsibility of a mortgage. That doesn't mean it can't be done. 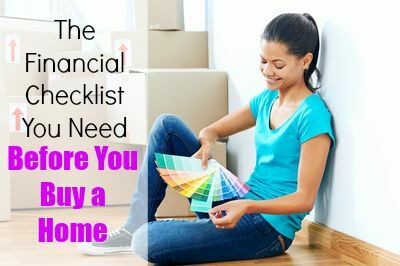 But it does mean you need to check these financial items off your list before buying a home. Do you know how much money comes into your accounts every month -- and how much goes back out? You need to acutely understand your income and your expenses. This is your cash flow, and it will play a large part in determining whether or not you can handle the financial burden of home ownership. Before buying, establish good habits around tracking and evaluating your monthly income and expenses. Knowing this information will allow you to accurately determine how much house you can afford on a monthly basis. In addition to understanding your cash flow, you also need a healthy emergency fund. The general rule says you need three to six months' worth of expenses, but you may want to boost your cash savings ahead of a home purchase. Repairs and maintenance on a home aren't cheap, and when something goes wrong there's no landlord to call to fix the problem. Most mortgages don't come cheap, and for many of us the monthly payment is the largest financial obligation we need to address. That may be a little easier to do if your other debts are cleared off the table first. You also want to boost your credit score as much as possible before applying for a home loan, and paying off debts will certainly help with that. The better your credit score, the more likely you'll receive a lower interest rate on a mortgage -- and that can save you tens of thousands of dollars in interest over the lifetime of the loan. In addition to getting your debt under control, you'll want to ensure you're on the right track with your retirement goals. If you're behind, you may want to take more time to catch up before funneling money into a home purchase. There are a number of ways you can check to see if your retirement savings are on par with where they should be for your income and your age. Check out Bankrate's retirement calculators, go by rules of thumb like Fidelity's "8x" rule, or evaluate your total net worth to determine where you stand. Not sure where to save? Employees with 401(k)s should contribute at least enough to secure a match if it's offered. Anyone can contribute to an Individual Retirement Account, or IRA and many young investors choose Roth IRAs because your earnings can grow tax-free. And if you're self-employed? Consider a SEP IRA or Solo 401(k) for your retirement savings. One of the biggest mistakes potential homebuyers make is failing to understand the true cost of home ownership. A mortgage calculator can help you figure out your monthly payment based on the principle and interest of your loan -- but it may not take into account things like the cost of homeowner's insurance and property taxes, which can change year to year based on the value of your home. Do your research and understand not just these expenses, but also the cost of common repairs, necessary maintenance throughout the year and how much it is to make upgrades or replace things like appliances. There's more to think about on the financial side of things when you're buying a home, but this checklist will help you cover the basics. Being aware of your financial situation and understanding real costs and what you can actually afford will help you stay on budget when you start house hunting. Alpharetta "Project of the Year"
It may seem like counterintuitive kudos, but the Avalon development in Alpharetta was recognized by the Urban Land Institute as the "Project of the Year" at their annual awards banquet last week. According to the Saporta Report, Mark Toro, a partner of North American Properties who developed Avalon, called the project Atlanta's first "urban burb" during the acceptance speech. Other projects that received recognition included Krog Street Market and the Beltline's Eastside Trail. The "Project of the Year" honor is ULI Atlanta's most prestigious award, and Avalon was the most suburban of all finalists. Could Minimalist Manse Convert Cobb's Staunchest Haters? Don't let the traditional exterior fool you: This 17-room Marietta mansion has enough minimalist panache and upscale flourishes to fill a mid-rise Buckhead loft building. The listing stresses the distance from here (Riverside Park Estates) to Buckhead (10 miles) and Chastain Park (seven miles), which begs the question: Does this arctic palace have what it takes to lure devout intowners to Cobb? After all, seven-bedroom Goliaths with 7,400 square feet aren't all that prevalent ITP. A few highlights: There's a full-fledged home gym and what looks like a basketball/racquetball court. The marble-rich master bathroom has dual rainfall showers. The laundry/mud-room combo could moonlight as a top-flight kitchen with a locker room attached. Drawbacks (beyond location): The terrace-level kitchen is so sparse, modern and steely it looks clinical. The property was initially listed in March, delisted earlier this month and now thrust back upon the market, holding firm all the while at $3.5 million. They are a blight on neighborhoods and bank balance sheets: homes in the foreclosure process, some in limbo for several years, their former owners gone but the home still not repossessed by the bank. They were dubbed "zombies" because their empty state was seen as a danger to both the neighborhood and the overall health of the housing market. Banks had let these homes sit because they were of so little value and because of endless foreclosure processing issues. Most are in disrepair, some occupied by squatters or drug dealers. But now, things are changing. The legal process has been largely streamlined, and as home prices rise nationwide, so too do the values of these zombie homes; banks are now pushing them through the foreclosure process and out to auction far more quickly. There are now about 127,000 zombie foreclosures, down 10 percent from a year ago, according to RealtyTrac, a foreclosure listing and analytics company. That means that one in five homes that are in the foreclosure process, that is the legal process has started but the bank has not yet repossessed the home, are vacant. Despite the overall drop, zombie foreclosures are rising in some of the highest-priced markets, such as Los Angeles, New York, Boston and Houston. That is because banks are moving the process more quickly in order to take advantage of rising home prices; so former owners are finally moving out. When the house is vacant, it becomes a zombie. "They've been able to stay in that home and maybe fight foreclosure for three, four, five years, and now finally the bank is coming back with all their ducks in a row, the proper documentation, and the homeowner is seeing the writing on the wall that I'm going to have to leave and move on with my life," said RealtyTrac Vice President Daren Blomquist. In just the last two months, banks have really ramped up on repossessing homes. These so-called REOs (bank repossessions) are now at a 17-month high. This, as the value of these former zombies rises amid strong housing demand and tight housing supply. "The average price of a zombie foreclosure nationwide was $195,000, so we're not talking about just $20,000 or $30,000 properties here," added Blomquist. That is good news to neighbors, like Ariel Seeley, who recently moved into a transitional Washington, D.C., neighborhood with her young family. The end unit is a foreclosed, vacant home in Washington, DC's Petworth neighborhood. RealtyTrac estimates its value at $600,117. "For us as neighbors, we'd love to have people move in and occupy the houses," Seeley said. "It makes it seem a little unsafe or dreary when you're walking by and you see vacant signs, and you don't know what's going on with the houses." The phenomenon, however, like all real estate, is very local. While some areas are seeing the zombies annihilated—moved to auction and final sale—quickly, others are not. "In Chicago, you've got a real variation within the city among markets. You see stronger neighborhoods where prices have gone up steadily, and those areas are not where the zombie foreclosures are located," said Geoff Smith, executive director of the Institute for Housing Studies at DePaul University. "There are neighborhoods that continue to struggle, and those price levels are still well below where they were at the peak or even in 2000." Banks are honing in on foreclosures in stronger local markets, but there is a cost to completing a foreclosure and a cost to selling the property, and in some areas there is not necessarily a market that would bear these costs. In those cases, the vacant homes sit longer and continue to be a blight on the neighborhood. —CNBC producer Stephanie Dhue contributed to this report. Buyer's are Winning in this Market! It continues to be a sellers' market in many areas of the country, but that doesn't mean buyers everywhere are out of luck. The top housing markets for buyers are Philadelphia, Chicago and Cleveland, according to a report from Zillow. In these markets, inventory tends to be strong and homes stay on the market longer and often experience price cuts, which gives buyers more bargaining power. "There is a definite feeling that things are easing," said Skylar Olsen, a senior economist at Zillow. "We are heading toward better balance. Buyers will be able to take a little more time this year compared to last year." She added that there are some areas within the buyers' markets that can still favor sellers. Tight inventory throughout the country helped push home prices up 4.5% in January from the year prior, according to the S&P/Case-Shiller U.S. National Home Price Index. But homes in the top 10 buyers' markets are selling for nearly 4% less than the list price on average, according to the Zillow report. In sellers' markets, buyers get an average discount of less than 1%. On average, homes in the top sellers' markets sell nearly 43 days faster than homes in the top buyers' markets, according to Zillow. To determine the rankings, Zillow analyzed sale-to-list price ratios, the number of price reductions and days on market in metro areas across the U.S.
"Where the sale-to-list price ratio is low and discounts are high, many listings go through formal price cuts and it generally take longer to sell homes," Olsen said. Olsen said that many of the buyers' market cities have had a slowdown in growth, and didn't experience the tech and energy job booms. "Top buyers markets were generally in areas that were once founded on manufacturing jobs, which have slowed and not returned in earnest."